Three Democratic senators on the committee that oversees the Environmental Protection Agency are asking for answers on reports that the agency granted significant raises to two aides and whether Administrator Scott Pruitt lied about his knowledge of the raises in an interview on Fox News. The Atlantic reported last week that Pruitt granted raises to two of his aides at the EPA under a provision of the Safe Drinking Water Act after the White House personnel office denied the raises. Pruitt reportedly granted a more than $50,000 raise to policy adviser Sarah Greenwalt, who previously worked as Pruitt's general counsel in Oklahoma, bringing her salary to more than $160,000. He also reportedly sought a $28,000 raise for an aide that worked on his political team and now works as scheduling director at the agency. The raise would have brought her salary to more than $114,000. The provision in the Safe Drinking Water Act states the EPA administrator can appoint up to 30 people outside of normal federal hiring laws if it is seen as "necessary to the discharge of his functions" related to safe drinking water. Pruitt denied that he knew about the raises in an interview on Fox News last week and said he canceled them when he found out. "I did not. My staff did. I found out about that yesterday and changed it. The process should have been respected and I issued a statement walking back those pay raises that should not have been given," he said, adding that "those staffers who were involved in that process should not have done what they did." Two EPA officials told ABC News that Pruitt knew about and supported the salary increases. One of the officials told ABC News that "the second we saw the Fox interview we all said he was lying." 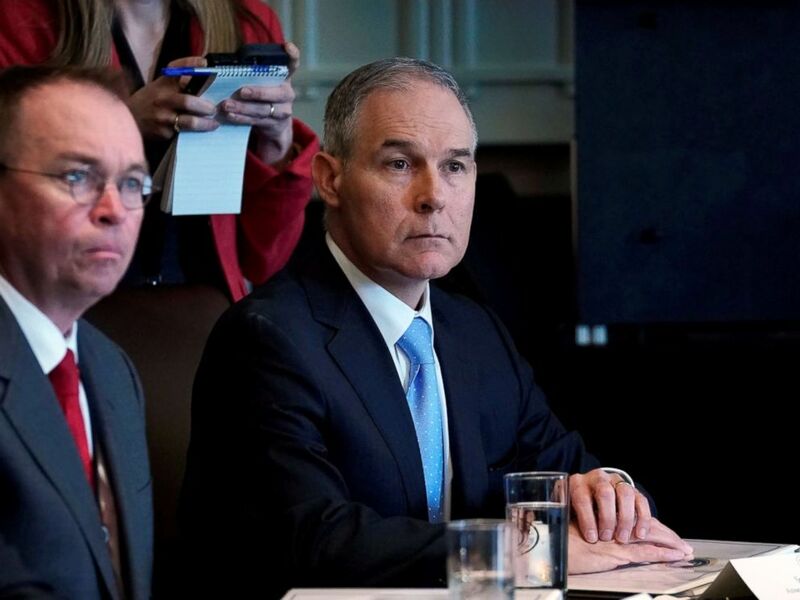 Environmental Protection Agency administrator Scott Pruitt listens as President Donald Trump holds a cabinet meeting at the White House, April 9, 2018. Sen. Tom Carper, D-Del., ranking member on the Environment and Public Works Committee, which has oversight of the EPA, tweeted that he and Sen. Sheldon Whitehouse, D-R.I., were also told by an EPA source that Pruitt's statement wasn't true. The senators wrote to the EPA Monday questioning Pruitt's claim that he didn't know about the raises and asking for copies of all documents and communication related to the decision to grant the raises. In that letter, the senators wrote that after the Fox News interview, the senators received information from an EPA official that they say "directly contradicts" Pruitt's statement in the interview. The senators have not disclosed their source so it's unclear if it is the same person that talked to ABC News. Sen. Tammy Duckworth, D-Ill., also asked the Government Accountability Office to look into the raises in a letter on Monday. Duckworth is on the Environment and Public Works Committee as well. EPA chief of staff Ryan Jackson said in a statement to The Atlantic that Pruitt had no knowledge of the raises and that these personnel actions are handled by him, EPA's HR officials and the Office of Presidential Personnel. “Administrator Pruitt had zero knowledge of the amount of the raises, nor the process by which they transpired,” Jackson said in the statement, reported by The Atlantic, adding that "any communications claiming otherwise are simply inaccurate." The EPA's internal watchdog is currently looking into appointments under that law and the raises would fall under the scope of that investigation. Duckworth wrote that if EPA employees approved the raises without Pruitt's knowledge, as he said in the Fox News interview, the raises would have violated federal law. She said in her letter that there is "ample evidence" that the employee who granted the raises violated the Antideficiency Act, which prohibits federal employees from authorizing spending that exceeds taxpayer funds allocated to that purpose.